I’ve worked in music education for a number of years now and I realised recently that I often talk to my students about the bass guitar tuition books that were important to me when I was learning. For the sake of space, I’ve tried to boil this down to list of just three books, all of which I still consider to be very important to any bass player’s development. In my humble opinion, every bassist should own these books! 1. 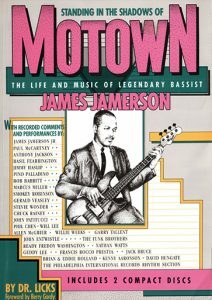 Standing in the Shadows of Motown: The Life and Music of Legendary Bassist James Jamerson. This book is genuinely one of the best bass books out there. It begins with a detailed biography of Jamerson which includes contributions from many of the musicians he worked with, as well as members of his family. There is also valuable information about Jamerson’s equipment and the Motown recording studio. Then of course there’s the transcriptions: 48 songs are covered throughout the book, many of which are transcribed in full. Each song is introduced by a well-known bass player, who also talks about the influence Jamerson had on them when they were learning. Pino Palladino, Marcus Miller, Bob Babbitt, John Entwistle, Geddy Lee and John Patitucci are a just a few of the players featured here. There’s also an intro from Paul McCartney and the book comes with CDs including backing tracks and audio snippets of the players mentioned talking about Jamerson. Make no mistake, you get a lot for your money with this book! What You’ll Learn: aside from some important musical history, you’ll be learning all of the ingredients that made Jamerson’s basslines so special: heavy syncopation, use of chord tones, ghost notes, open string jumps, chromatic passing notes, enclosures and more. Plus, if you can read the lines in this book you’ll be able to read pretty much just anything. 2. Building Walking Basslines (Ed Friedland). I studied extensively from this book when I was at university and it’s one of the best things I’ve ever done as a musician. This is a very thorough method for learning to improvise walking basslines. It starts you off with the basics: root, fifth and octave, before demonstrating arpeggio-based lines, scales approaches and how to use chromatic and dominant approaches. All concepts are demonstrated using common jazz chord progressions such as the jazz blues and ‘Rhythm Changes’ and there are ten full jazz standards to practice over at the end of the book. When I was learning from this book, I transcribed all of Ed’s examples from the CD too. What You’ll Learn: I know what you’re thinking – you don’t want to be a jazz bass player! Well, you don’t need to be. However, studying jazz – or at least some elements of it – will make you a far better player then if you only focus on styles such as rock, or funk. The good news is that everything you learn is completely applicable to all other styles as well. 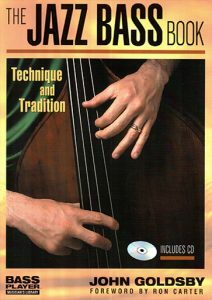 One of the main benefits of learning walking bass (or jazz in general) is that it teaches you about music in a level of detail that other styles typically do not: intimate knowledge of chord construction and a solid understanding of the fingerboard are both required and this book will help you with both. 3. The Jazz Bass Book (John Goldsby). This is an excellent book, both as a reference and as a practice resource. All of the key bass players throughout the history of jazz are covered here, with a detailed biography for each. It covers everything a bass player needs to know in order to begin playing jazz: walking and soloing techniques, popular forms including the jazz blues and ‘Rhythm Changes’, ii-V-I progressions, the ‘Coltrane Matrix’ and more. There are also studies to learn based on popular jazz standard progressions and everything is supported with audio content on the CD. What You’ll Learn: As I said above, you don’t have to be a jazz bassist to get a lot from studying it. Immersing yourself in the walking bass ideas and études presented here will do wonders for your playing in terms of techniques, fingerings, aural skills, fretboard knowledge and more. 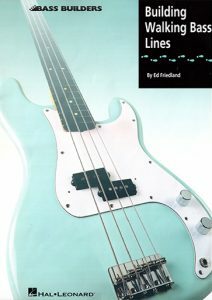 Because I view these books as essential reading for bass players, I’ve worked with the UK distributors to make them available through Bassline Publishing. We’re offering them at lower prices than most of the bigger sheet music suppliers on the net too. I hope you found this useful. Please do let me know about YOUR favourite bass books! Along with your stuff, I agree these are among the best out there. I like all of Ed Friedland’s books. I have to work my way up to some of the things I’ve purchased, like Tony Grey, Janek Gwizdala and Joe Hubbard books. Thanks, I'm also a big fan of Ed's books, great stuff.